The Euro 2016 Championship has thus far provided us with a plethora of late, late goals; some very surprising results; the strangest of final group tables that have left us with the most lopsided last 16 draw imaginable; and the usual England fayre – the struggle to get going, and after three games still the uncertainty of our best team selection. One thing I have also enjoyed is seeing Dulwich Hamlet terrace legend Stephen Child running the line in several games as referee’s assistant. 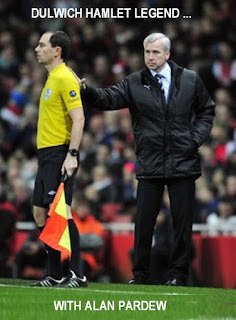 Steve is a familiar face to Premier League supporters having helped officiate in a couple of hundred games in the last eight seasons, twenty odd Champions League matches, and is rightly regarded as one of the nation’s top men in black (or yellow, or pink, or green). The 42 year old has already assisted in the Germany v Ukraine and Hungary v Portugal matches and I don’t doubt he will be involved in one or two more, maybe even the Final tie itself if referee Mark Clattenberg continues to do well in the centre of the pitch. 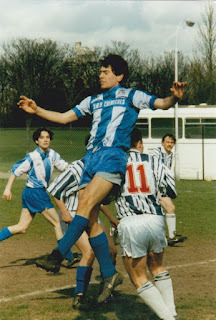 Steve was a regular in the Dulwich Hamlet Supporters’ team during the 1990s, when he was in his late teens and early twenties. He is certainly one of the finest players I played alongside in the pink and blue. If I remember correctly, Steve also turned out a few times for the Dulwich Hamlet Reserves. 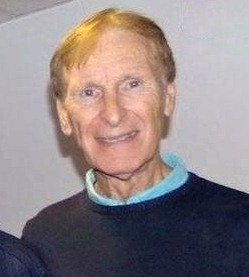 It would be nice to meet up with Stephen Child again and reminisce about the old days. Perhaps someone has his contact details so we can invite him down to Champion Hill and do a Q&A in the bar. 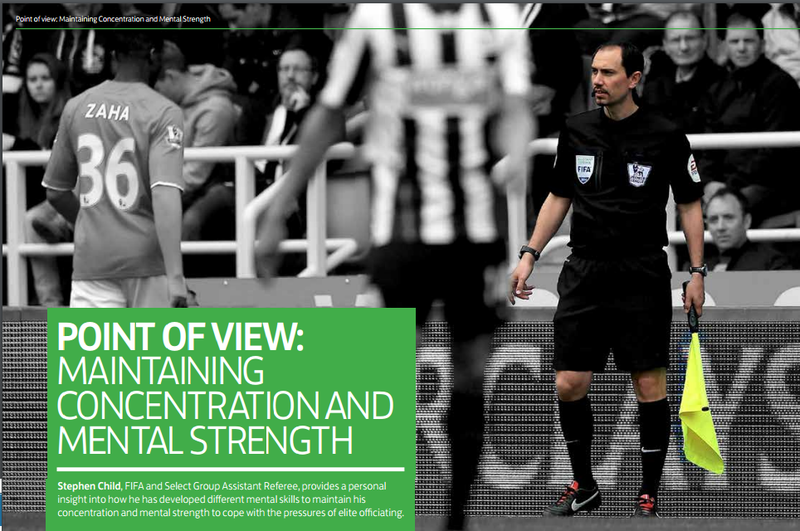 Stephen Child, FIFA and Select Group Assistant Referee, provides a personal insight into how he has developed different mental skills to maintain his concentration and mental strength to cope with the pressures of elite officiating. As a match official, you are always mindful of your concentration levels. One lapse in your attention levels during a match could prove costly and the consequence can be significant. With points at stake for the teams concerned, for them, it could ultimately be the difference between promotion and relegation, while for you as an official it could lead to relentless media coverage exposing your error to the world for all to see. It is therefore imperative that you develop a strong level of concentration during matches and develop skills to cope with pressure. I remember when I first started lining. It was very easy to switch off and allow your mind to wander, especially during a one-sided match where most of the action was down the other end. I noticed very quickly that this meant that you could easily miss incidents or lose your positioning with the second rearmost opponent. To help me combat those moments, I found the best way was to do a running commentary of the game. It had an immediate impact on my performance and I was able to appreciate team tactics, recognise offences and identify players, which at times helped the referee when he needed to discipline players. For me this was a valuable lesson learned and one that has helped me to reach the level I am at now. That being said, due to the speed and unpredictability of players and general play, it is inevitable that mistakes occur but to me this is not a failing. It is only a failure on your part if you do not reflect on it and put steps in place to try and avoid it happening again. For example, in my first match this season a situation occurred in which I gave a throw-in the wrong way just after half-time. A lapse of concentration meant that I had not remembered the direction the teams were kicking. As this had rarely ever happened before I just put it down as a one-off. However, a few weeks later the same thing happened again. I had been lining for nearly 20 years and never had this problem before, so why was it happening now? To help me understand I analysed both incidents, discussed them with my coach and developed a new strategy that would help me reduce the potential for reoccurrence. This new strategy involved, at the start of the second half, moving the flag from hand to hand and saying aloud the colour of the team that’s kicking in that direction - I also do this after a long stoppage or injury. Thankfully this seems to have done the trick. Without doubt, operating in the Premier League and on international matches is hugely demanding on a number of levels. As an elite official you not only have to have a high level of fitness to cope with the speed of the game and keep up with the pace of players, but you must also possess the mental skills to cope with the intense pressure that you experience from the moment you receive an appointment. Often there is large scale media attention on the two teams involved, especially if it is a big game such as a top of the table clash, local derby or relegation battle with newspapers, satellite TV and social media often commenting on the match daily in some format leading up to it. But this is where preparation is vital. After receiving a Premier League appointment on the Monday before the match, it’s important to then organise a training schedule and travelling arrangements to ensure you are at your peak. I also like to do a bit of research on how the teams are performing; who is likely to be playing; what kind of formation and team tactics the teams may have and if there have been any previous negative moments between the two sides. Although you should never prejudge what will happen, I find it helpful to be ready for what could happen so that it’s not a surprise. And that is especially important when you consider the fact that, thanks to the media coverage that the Premier League attracts, your performance will be scrutinised by everyone - the PGMOL, The FA as well as your colleagues, family and friends. There really is no hiding place. So, after each match I try to analyse my performance like an assessor. I obviously confront any errors that I may have made and think of ways they could have been avoided and how to prevent them happening again, but I also think it is important to praise yourself for the good things that you did. Ultimately, this preparation – alongside support from monthly meetings with our coaches and our sports psychologist – allows me to go into my next match with a positive frame of mind and the feeling that I will be able to put into practice what I’ve learnt from the previous match. As an assistant referee, there will be many occasions when the ball is not in your half. This is when you must stay focused. You could find yourself standing at the halfway line watching the play, perhaps thinking about your previous decision. If I start to do that, I say the word SUMO which is an acronym for: Shut Up Move On. This acts as a trigger for me to stop thinking about my last decision and gets me to refocus on the field of play. It is obviously important to move on quickly, because if you don’t there could be another big decision to make, and it has often been said that incorrect decisions regularly occur after a contentious incident has just happened. I consider it to be essential to have a balanced life away from football. Quality time with my family, friends and playing tennis is my way of getting away from it all and unwinding. My family and friends have had to be so understanding when I have had to miss important occasions such as weddings, christenings and even holidays due to the demands of my matches, so when I do get free time I try to make the most of it. 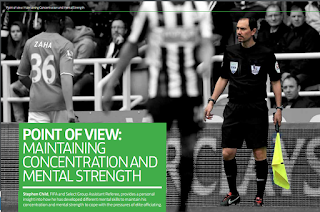 Click HERE for the link to download Refereeing Magazine Vol 22 from May 2014. 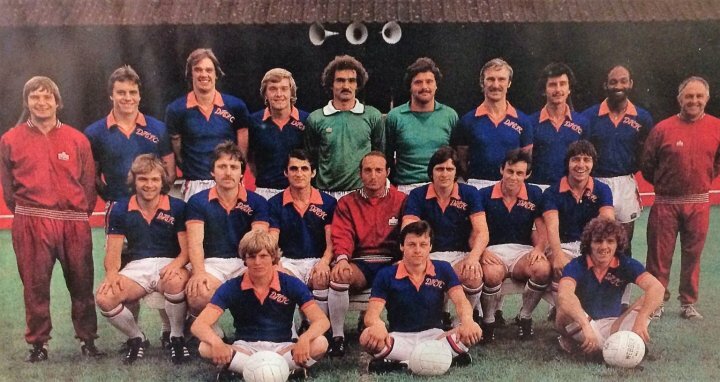 Rodney Brookes, a former Dulwich Hamlet defender from the 1970s has passed away. We offer our sincere condolences to his family. Rodney made a visit to Champion Hill in December of last season when a large number of ex-Hamlet men met together to form the DHFC Former Players Association. For a brief summary of Rodney's career see the Dulwich Hamlet official website. 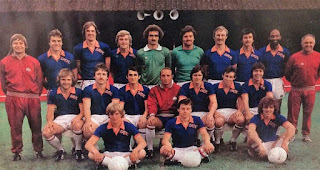 1979/80: Rodney Brookes, standing 4th from right.